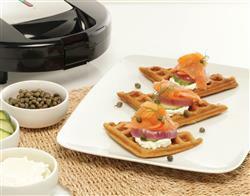 1.Preheat your Oster® Waffle Maker and wait for the green light to illuminate, indicating it is ready. 2.In a bowl, mix flour, baking powder and salt, and in another bowl mix milk, egg yolk and oil. 3.Beat egg white until it forms stiff peaks. 4.Incorporate dry ingredients into liquids then slowly fold in the egg white. Let mixture rest for 10 minutes. 5.Pour mixture in each of the removable waffle cooking plates being careful not to overfill. Lower the cover and lock securely. 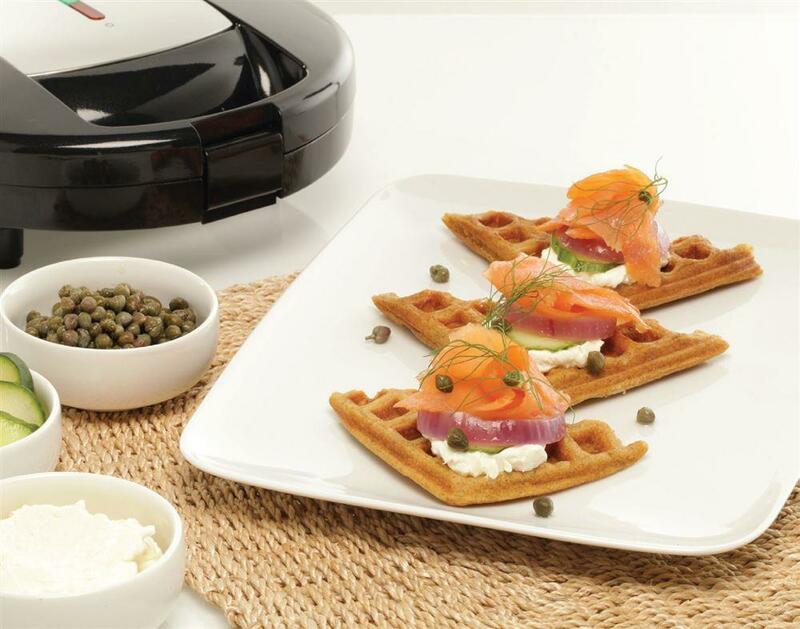 6.When the green light illuminates on the Sandwich Maker and the waffles are golden brown, serve them on a plate, spread on top the cream cheese; arrange a few slices of salmon, cucumber slices, onion rings, capers; garnish with some dill and enjoy a nutritious, healthy dish.